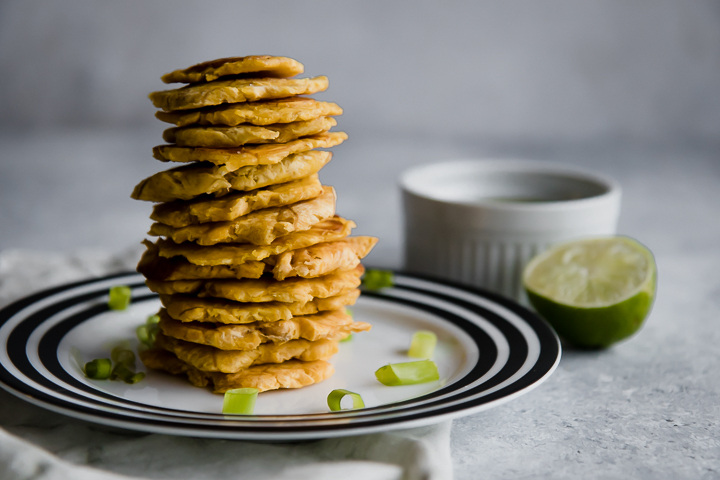 Healthy Baked Patacones with Mojo Sauce, a healthy take on the classic fried Colombian patacones (or sometimes called tostones). Smashed plantains baked and served with spicy mojo herb sauce. Delicioso! If I walked away from our recent trip to Colombia with one thing, it was this: I was in love with Colombian food and couldn’t wait to get home and share it with all of you. Traveling always inspires me to get in the kitchen and start experimenting. I snap photos of dishes I love, write notes on my phone about flavor combinations I’ve never heard of, and try to figure out how I can incorporate foods from around the world in my everyday cooking style (i.e. easy, fast, not too many ingredients, and enough for leftovers the next day). And after one day of eating in Colombia I knew that a healthy version of patacones, or smashed and fried plantains, was making an appearance on the blog. What are patacones (or tostones)? Where do they originate? Patacones, sometimes referred to as tostones, are smashed and fried plantains served with dipping sauce or as a side dish with soups. Patacones are found throughout Central and South America and the Caribbean in countries like Costa Rica, Nicaragua, Panama, Colombia, Venezuela, and Cuba, among others. In Colombia they are usually served with aji (hot salsa) or a cream sauce, but I’m a sucker for spicy green herb sauces (see exhibit A: carrot top chimichurri, exhibit B: lemon and dill sauce, and exhibit C: cilantro chimichurri) so I paired them with a Cuban garlic and herb mojo sauce. Delicious Colombian and Cuban fusion! 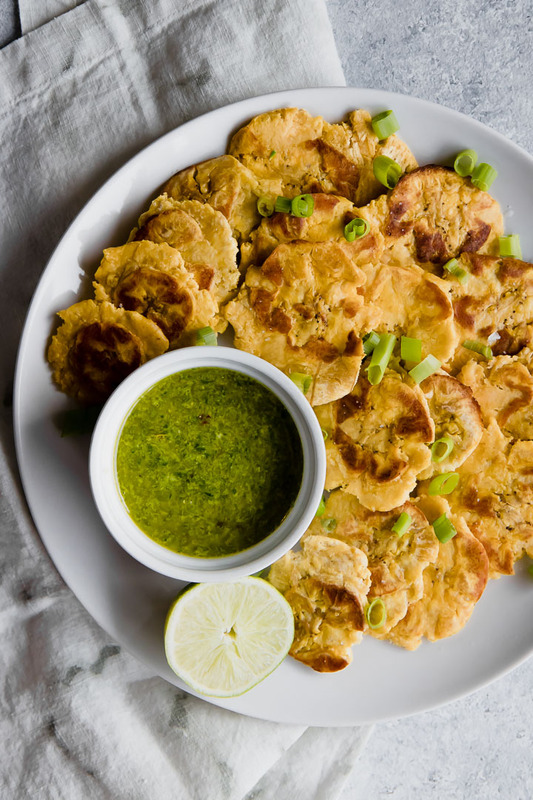 Traditional patacones and tostones recipes are fried–sometimes twice–so a would-be healthy recipes of just smashed plantains and an herb sauce is negated by being deep fried in oil. However, as a dietitian I am always looking for ways to make traditional recipes healthier and found that baking patacones and finishing them off by browning the in a pan with a bit of oil gives them that crispy chip-like texture without the hassle (and extra oil!) of deep frying. Can I use bananas instead of plantains for patacones? Yes! 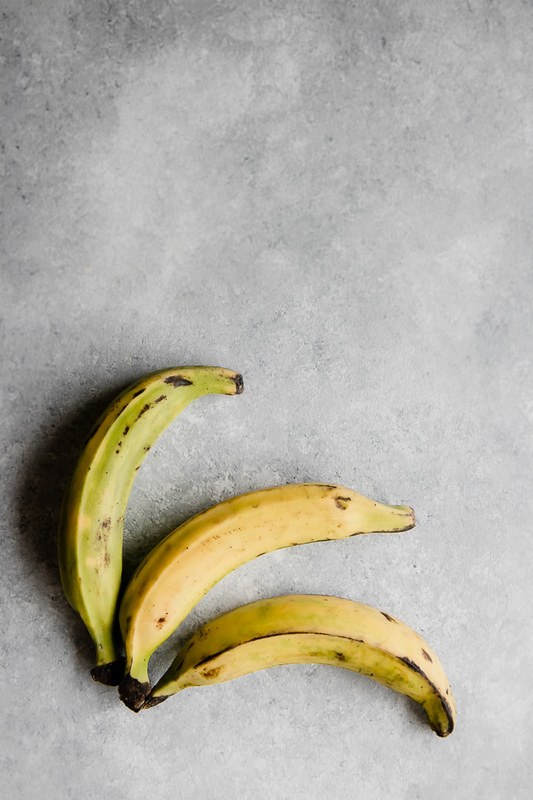 If your local grocery store doesn’t sell plantains then regular bananas will do, however I would suggest making sure they are not very ripe. A ripe banana will be too soft and may not hold its shape when mashed. 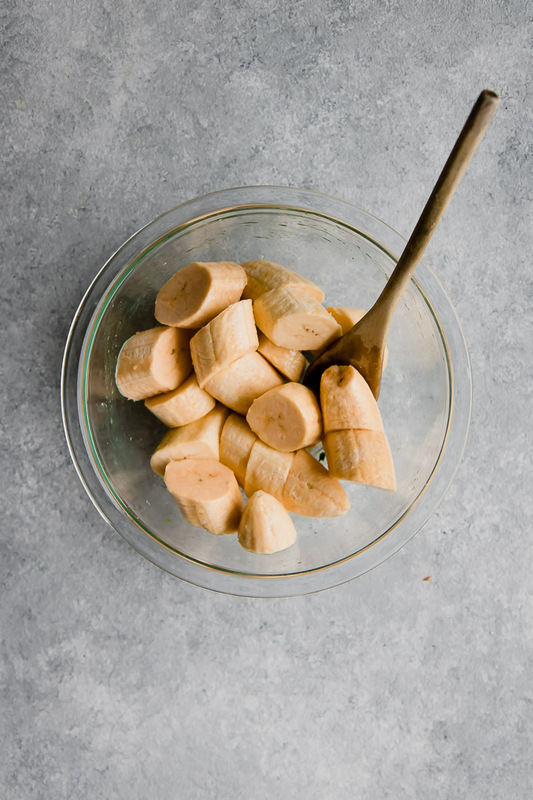 Bananas are typically much sweeter and softer than plantains, so the finished patacones may not be as crispy and will taste a bit sweeter. But a sweet patacon with spicy mojo would be a delicious combination! Patacones are essentially just sliced and smashed plantains, but there is a little trick to making them uniform. Choosing a bowl or large glass with a completely flat bottom (no ridges!) will ensure each patacon is uniformly smashed before baking. I chose a clear glass bowl with a smooth bottom (see photo above) so I could see the smashed plantains, but any smooth-bottomed bowl or glass will do. And I have to admit, it was oddly satisfying to smash plantains. What is mojo sauce? How do you make it? Mojo sauce is a blanket term used for sauces that include olive oil, herbs like cilantro/coriander, garlic, cumin, paprika, salt, pepper, and other spices. While green herb mojo sauce is more popular, some cultures use red versions made with red peppers and paprika. Most people associate mojo sauce with Cuba but many Caribbean cultures have their own take on the sauce, including the Dominican Republic, Haiti, Puerto Rico, and the Canary Islands. Mojo sauce, and all green herb sauces, is very simple to make: chop herbs and garlic and add all spices to a food processor with oil and pulse until well blended. That’s it! A super simple way to kick any recipe up a notch. 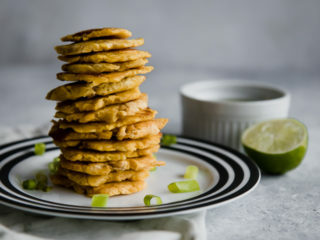 This patacones recipe is SUPER easy to make and doesn’t require much in terms of kitchen tools, however there are a few standard kitchen essentials I used that may help you make them perfect. Cookie sheets: I just replaced my very old (and very brown) cookie sheets for a new set and I was happy with the three different sizes in this set. Lodge cast iron skillet: I live and die by my cast iron skillet and its rough iron surface gives these patacones the perfect brown crispiness you’re looking for without the mess of a fryer. Slice plantains into 1 inch (2.5 cm) sections. Place in a bowl and toss with oil, salt, and pepper. 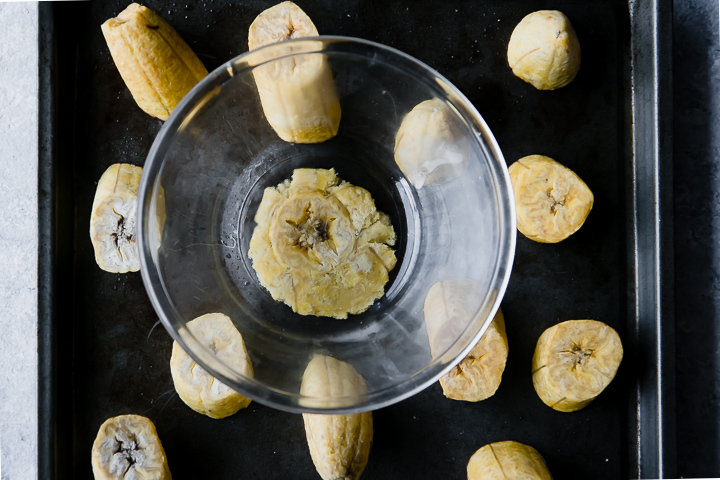 Using a smooth-bottomed bowl or glass, smash each plantain (see photo above for example). Place smashed plantains on a lightly greased cookie sheet and bake 10 minutes, then flip and bake about 5 minutes more (don’t burn!). If you’d like the patacones to be a bit crispier, heat a small amount of oil in a frying pan and heat them until they start to harden, about 3 minutes each side. Serve immediately with mojo sauce. Place chopped garlic, cilantro, chopped green onions, and bit of olive oil in a food processor and pulse until chopped but not blended. Add the rest of the olive oil, salt, black pepper, red pepper, cumin, oregano, lime juice, and lime zest. Pulse until integrated, but not smooth (about 5-6 pulses). Leftovers & Storage: Patacones can be kept in a airtight dish in the refrigerator for up to a week, but will soften over time. Heat over a pan to make them crispy again. Mojo sauce can be kept in refrigerator for 4-5 days and used over meats, vegetables, and in soups. Dietary Prefereces: This recipe is vegan and does not contain any major allergens. 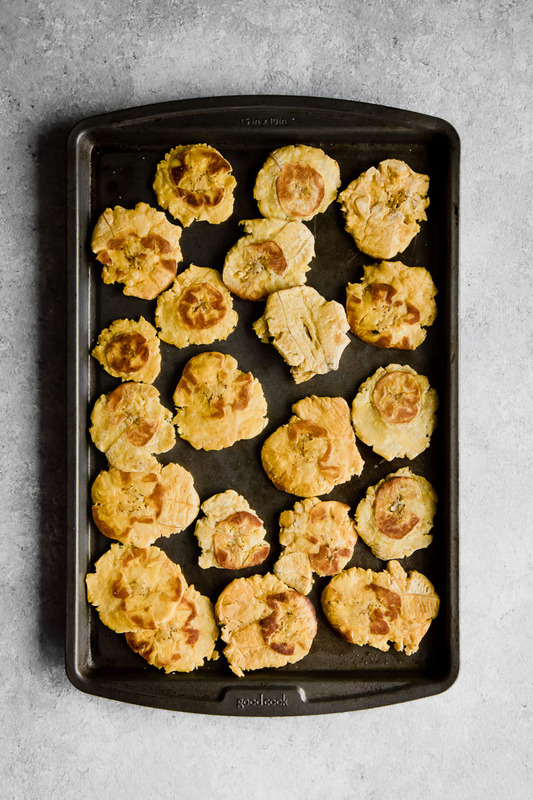 Loving this colombian healthy baked patacones recipe? I have many more Colombian recipes coming to the blog in the next few weeks. Stay tuned and save some space in your weekly meal plan to bring a little Colombia to your plate. Have you traveled to Colombia? Have you tried Colombian food? Which dishes did you love? Have you tried healthy baked patacones? Leave a comment or share your favorite recipes links below! Thank you, one of my favorite recent travel recipe inspirations. They’re so simple, almost like a thicker chip. Great for Superbowl? I don’t know what my family would think if I told them no potato chips, it’s all about the plantains, haha. Baked Patacones will be a first and I cannot wait! These look incredible especially with the Mojo sauce! I loved them on our recent trip to Colombia but hoped they would be just as delicious baked instead of fried, and I was pleasantly surprised! Plus they’re super easy, which is always THE deciding factor in this house. These patacones were so easy to make and now I’m searching for more recipes I can use them in. Suggestions are welcome! I LOVE patacones!! I don’t see recipes for them too often though- how fun!! They were one of my absolute favorite discoveries when I was in Colombia recently, I knew I’d be making my own version as soon as I got home. Thanks for stopping by! Thanks! Plantains are like a less sweet and not ripe banana, so much more firm. Which makes them a great choice for savory dishes like this. Thanks for stopping by! Oh my goodness…these look absolutely amazing! So delicious + incredibly nutritious! That mojo sauce sounds like the cherry to top off these mouth-watering patacones! I can’t get enough of spicy herb sauces lately, I think this mojo sauce deserves a post of its own! I have not eaten plaintains in years!! My grandma use to make some – mostly deep fried and we loved it. This is so creative. Must look for them in the supermarket soon. I love that! I only recently starting eating them and fell in love with savory plantains on our recent trip to Colombia. Most versions we tried were fried but I tested these baked and they were still delicious. They will definitely be making an appearance on our meal plan more often! love tostones and this healthier version is making me drool! i will give it a try very soon. Great! I enjoyed them while traveling in Colombia and couldn’t wait to try out a healthier version when I got home. baked version of a childhood favorite! Oh, the traditional version is delicious but I wanted to try a baked healthier version without the extra oil. It worked! I forgot how much I love plantains until seeing this! Such a treat with the crispy and savory outside. I love mine with a sprinkle of salt. Your baked version looks phenomenal and a much healthier option. Can’t wait to give that mojo sauce a try! Yes, they were perfect with a little salt and the spicy mojo sauce. And were great heated up the next day as well. Wow, these sound amazing! I’ve only tried plantains a couple of times yet loved them each time. And that mojo sauce! I’ll bet that would be great with so many things! Plantains are great because they’re not as sweet as bananas so they can go either sweet or savory. And the mojo sauce! Trust me, it’s going on EVERYTHING from now on. I’m going to have to bake a batch of these! I love patacones but have never had them baked. And the mojo sauce…yummm…I think that sauce could go on quite a few things! I had only had them friend during my travels to South America but they ended up crispy if baked and then finished off in a hot pan quickly right before serving. And the mojo sauce is my new favorite thing! What a unique recipe…I’ve never heard of anything like these but they look and sound delish! I’m all about making new recipes so this one is going on the list to make! Thanks for sharing! I was inspired by my travels! I love discovering new-to-me foods and experimenting to make them my own. Let me know if you try them! I love love love tostones! Can’t wait to try out this recipe and your yummy sauce! They’re so delicious and a healthy snack when baked. And the sauce! It’s going on everything from now on. These look and sound fantastic! WAAAAAAY better than those hard, dry banana chips. And with a sauce? I’m loving everything about this dish! I’ll ditch the hard chips for a slightly crisp patacone any day. And the sauce is now my favorite topping for everything from veggies to seafood to meat. okay. these look super easy and I liked how they are not fried. yasss. i have never eaten this but sound really yummy and healthy! They’re my new favorite snack–and so easy! I’ll try them again but only make them 1 inch thick. I ended up eating them with Cuban beef picadillo. Yummy!! Hi there, I’m so glad you tried the baked patacones but I’m sorry to hear they didn’t work for you. Were they too ripe? They plantains I used were not very ripe so they were a bit harder, maybe that made a difference. And because they’re baked they definitely do not crisp the way they would if they were fried but they did not a nice crunch from baking. Let me know if you try them again, I’d be interested to know how they turn out. Thanks for commenting!